Paintings recounting the story of Abraham and Sarah when they had three visitors. If one were to judge gender roles solely on the Bible, it may appear as though women play a less significant role than men. However, by reexamining history and looking at events through the eyes of females opposed to men, new suggestions about the actual role of women during this time period emerge. In Judith Margolis’s work “A Woman's Voice in a Man's Mouth: The Sarah Paintings of Richard Mcbee,” Margolis analyzes the paintings of Richard Mcbee, which aim to recreate the story of Sarah and Abraham from Sarah’s perspective. Richard Mcbee believes that “we are trained not to notice or hear the women...but when I start looking, they aren’t in the back seat. They are the engine; they energize the story and drive it forward!”[i] Mcbee’s painting includes dialogue from Sarah as the incidents are occurring, showing that she was in control of much of what was happening. When Abraham conceived a child with Hagar instead of Sarah, Mcbee argues the plan all along was Sarah’s, captioning the painting pictured below: “I tried for ten years to have Abram’s child, to no avail. I was barren. So I gave him my maidservant, the Egyptian Hagar, to provide Abram with an heir.”[ii] This caption shows that instead of Sarah being thrown to the side for a woman who was not barren, Sarah chose to give Abraham Hagar, allowing her control over Abraham and his actions. A later painting by Mcbee shows the events of Abraham instructing Sarah to bake cakes for their guests after Abraham’s covenant of circumcision with God. 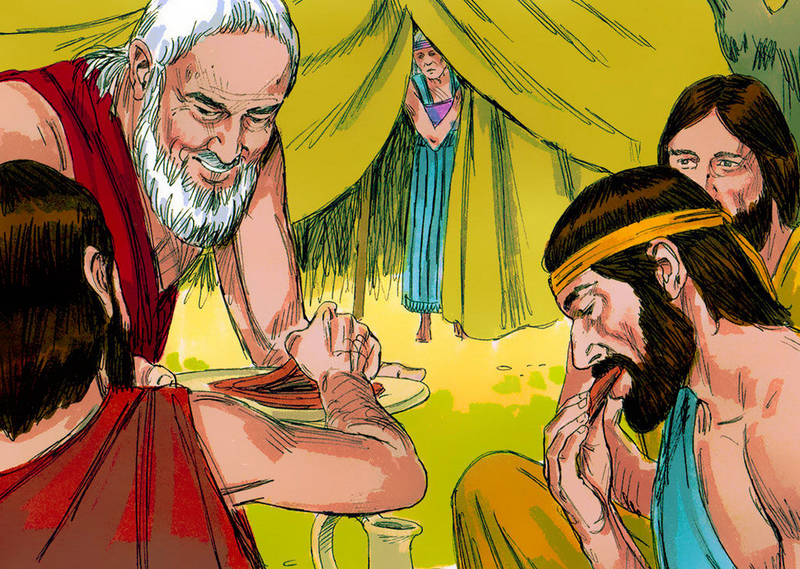 In traditional Scripture, this interaction simply as Abraham instructing Sarah to prepare the food for the guests, Mcbee’s painting and captions show how underestimated Sarah’s capabilities are. The below painting, from Sarah’s point of view, is captioned: “After Abraham circumcised himself as God had ordered, three strangers arrived. My husband ordered me, as if I didn’t know what to do, to make fine cakes for the new guests.”[iii] This caption suggests that Sarah’s capabilities are greatly undermined by the men of her time. Men did not think her capable of basic tasks, such as knowing when to bake for guests. [i]Margolis, Judith. “A Woman's Voice in a Man's Mouth: The Sarah Paintings of Richard Mcbee.” Nashim: A Journal of Jewish Women's Studies & Gender Issues, no. 22 (Fall 2011): 3.